NRAO/AUI/NSF; D. Berry/SkyWorks; ALMA (ESO/NAOJ/NRAO)Deep in the heart of the Abell 2597 Brightest Cluster Galaxy, astronomers see a small cluster of giant gas clouds raining in on the central black hole, as illustrated in this artist concept image. Up until now, scientists believed that supermassive black holes gorged themselves on a strict regimen of hot, ionized gas from the halos of galaxies. But a new study that will be published June 9 in Nature might change that belief. 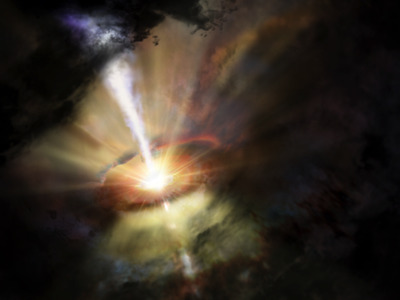 The study shows a supermassive black hole getting ready to dive into a “clumpy, chaotic downpour of giant clouds of very cold molecular gas,” the European Southern Observatory (ESO) says in a news release. These new findings look at the way black holes devour fuel and attract surrounding matter. Black holes usually sustain themselves by steadily gulping in hot gas, which spirals in slowly from a surrounding disc of cosmic material, according to a Yale news release. But, this study is the first direct evidence that “cold, dense clouds can coalesce out of hot intergalactic gas and plunge into the heart of a galaxy” to feed supermassive black holes sitting at the center, the ESO says. This new information will transform our understanding of how supermassive black holes feed. This ‘rainstorm’ requires just the right cosmic weather conditions to form: Hot gas hanging out in the galaxy cools, condenses, and forms clumps of cold gas. The group of three cold gas clouds, which this greedy black hole is preparing to gobble up, travels more than 600,000 miles per hour towards it. Each cloud measures tens of light years across and contains as much material as a million suns. The study results suggest that black holes have two dinner modes, said co-author Michael McDonald in an MIT news release. Most of the time the black hole survives on a modest diet of hot gas, but every now and then it has a cheat day and binges on cold clumpy gas. Astronomers believe that there could be thousands more cold gas clouds nearby, which could provide the black hole with many more meals to come. Since we don’t know a lot about how these supermassive black holes interact with the rest of the galaxy, said co-author Louise Edwards in the Yale news release, this is a real step forward. The astronomers used data from a telescope in Chile to track the movement of the gas in a neighbourhood of 50 galaxies one billion light years from Earth called the Abell 2597 Cluster. They plan to use the telescope to search for similar “rainstorms” in other galaxies to find out how common it is for this cosmic weather to occur.